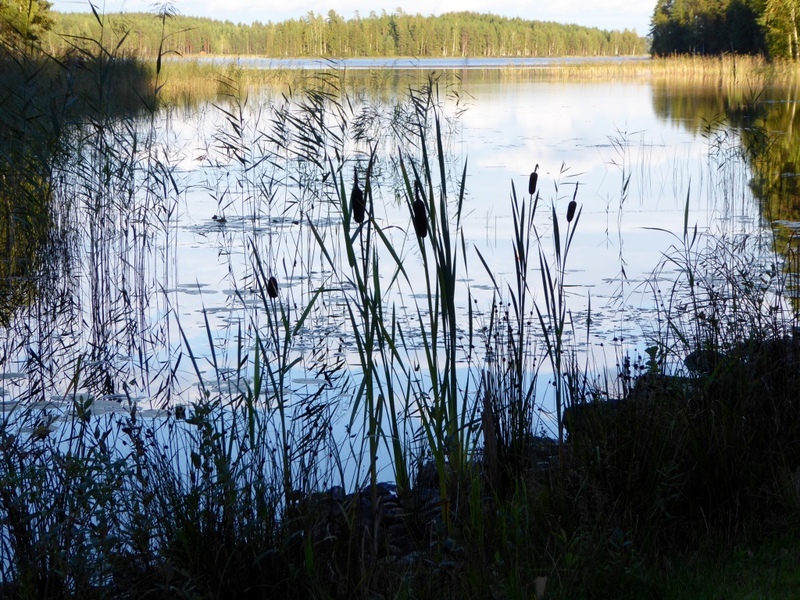 Sanski lives by one of Finlands lakes. We have about one thousand lakes! It was a calm, beautiful day when we arrived, and continued to be so the next days. This Finnish top from Pirtin Kehräämö thinks it’s a snowman, only needing a couple of arms and eyes, and a nose and mouth to be perfect. But oh what a surprise: soon it’ll be teared apart and sprinkled with dyes! Sanski got quite excited and acid dyed a lot of top after we had left her alone so she could flip out in peace 🙂 I’m sorry I don’t have a photo to show! 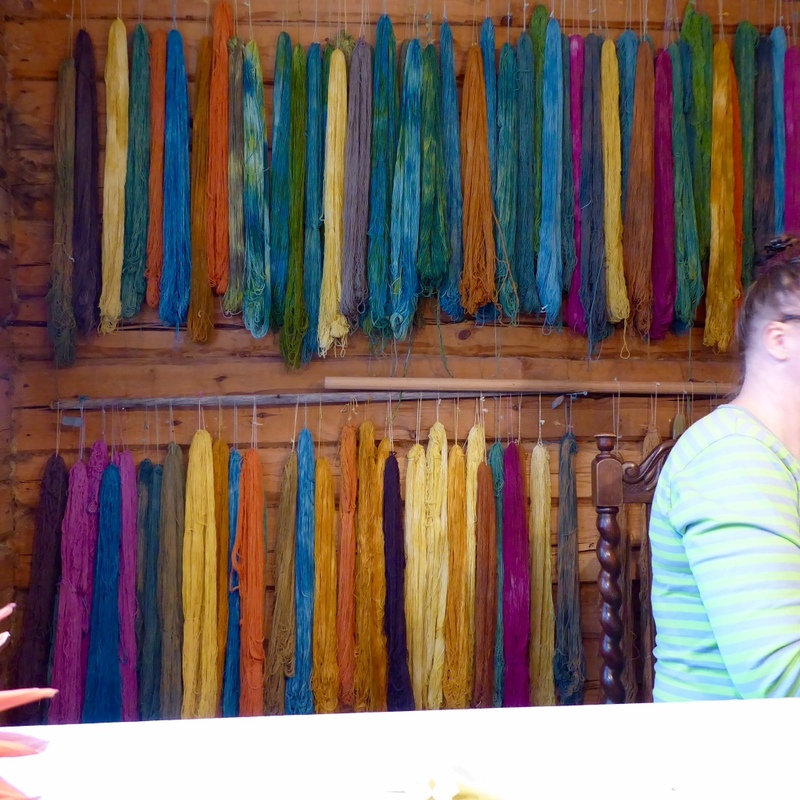 But here is her wall of yarns dyed with natural colours, all light fast. Her dyeing is magical! That’s a yarn spun by four spinners from different wools for the core, different types of mohair for the bouclé wrapping, and the same cotton sewing thread as binder. Please admit we were very clever and skilled! We also used different wheels: two upright Scotch tension, an antique Saxony, and a Hansen Minispinner. 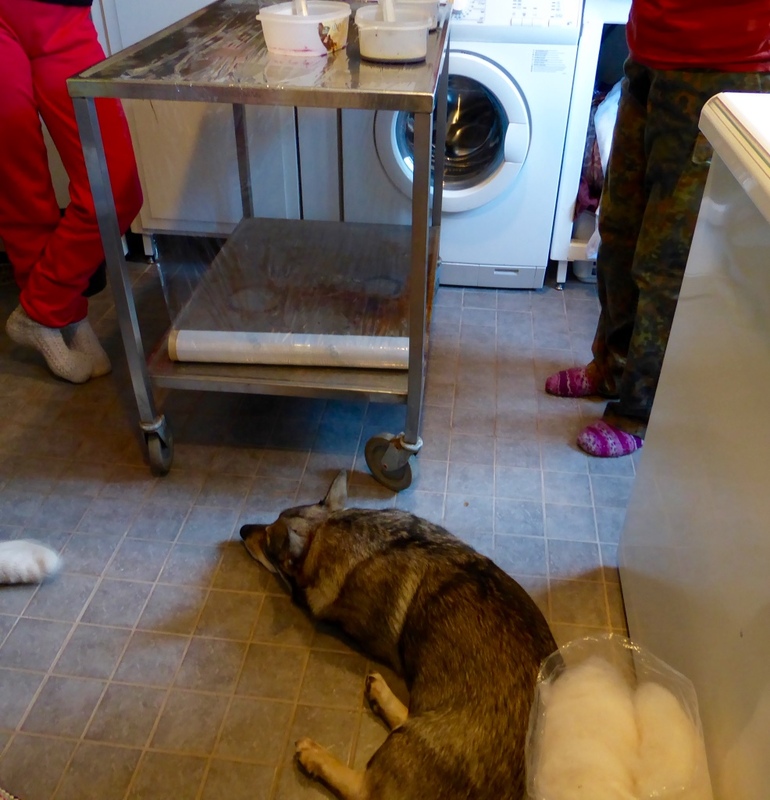 My reflexions from those three days: we four spinners are as different as dyers as we are as spinners. 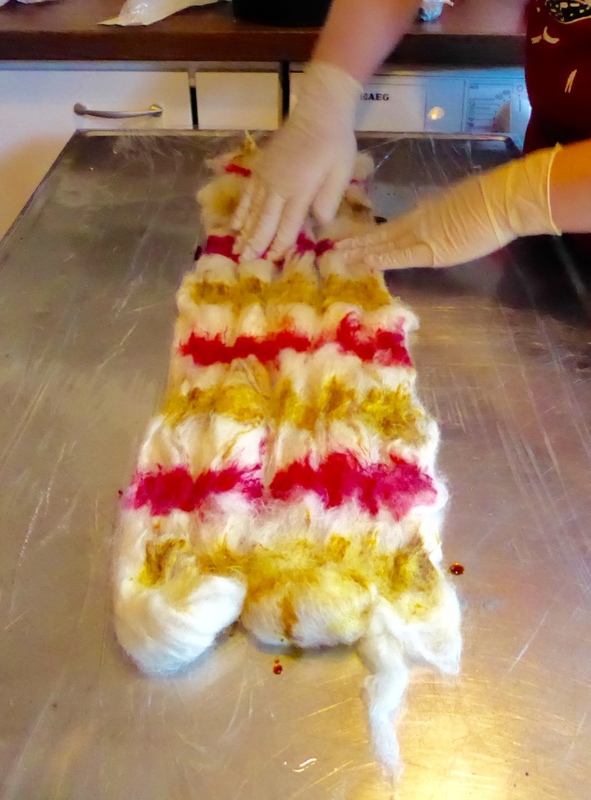 Spinning and dyeing is so similar to your temperament. I think we four friends cover the most common types: the impulsive, and the thoughtful and meticulous, and a mix of these. But he was happy in the beautiful woods of that region. Hubby took him for long walks, and in between they just rested. 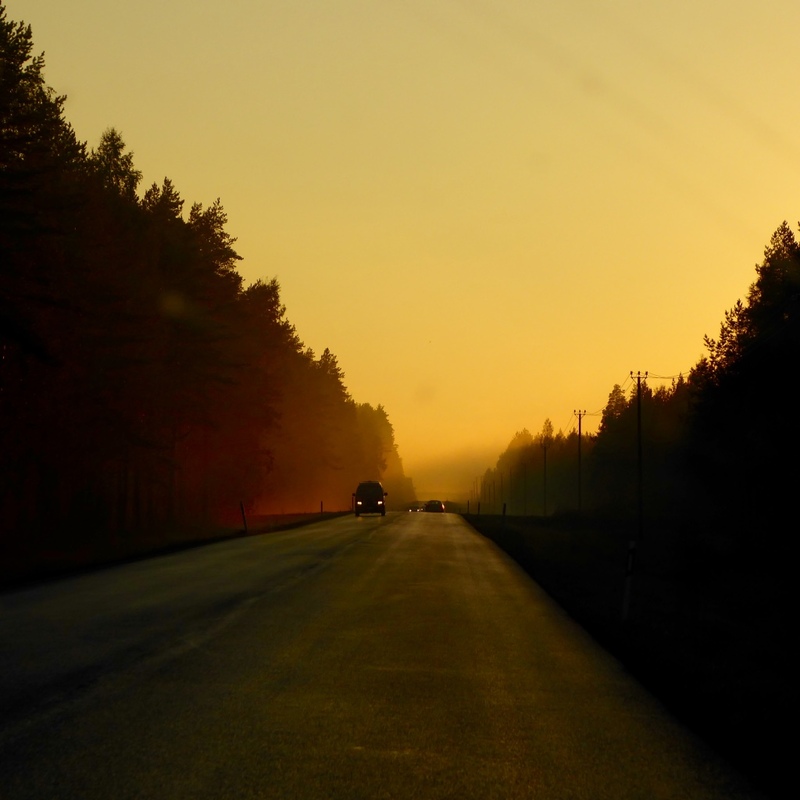 Hubby, Kasper and I had a fast and beautiful trip home. We haven’t been much in that area of Finland. We both fell in love with the nature with the forests and lakes, and the small hills. 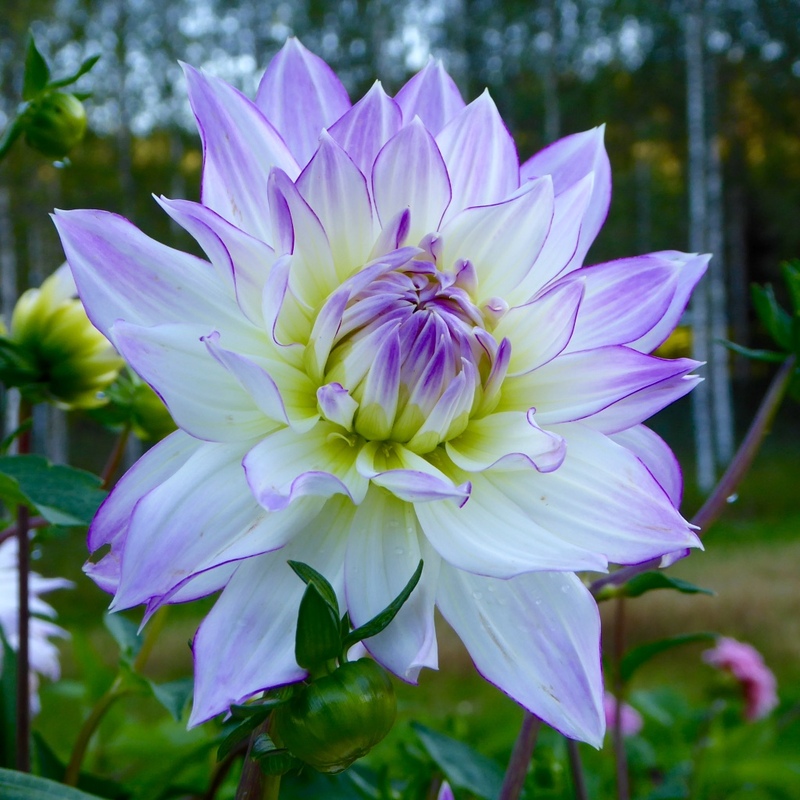 September 11, 2016 - 7:18 pm Marilyn F.
What a beautiful dahlia! They are such a beautiful flower. 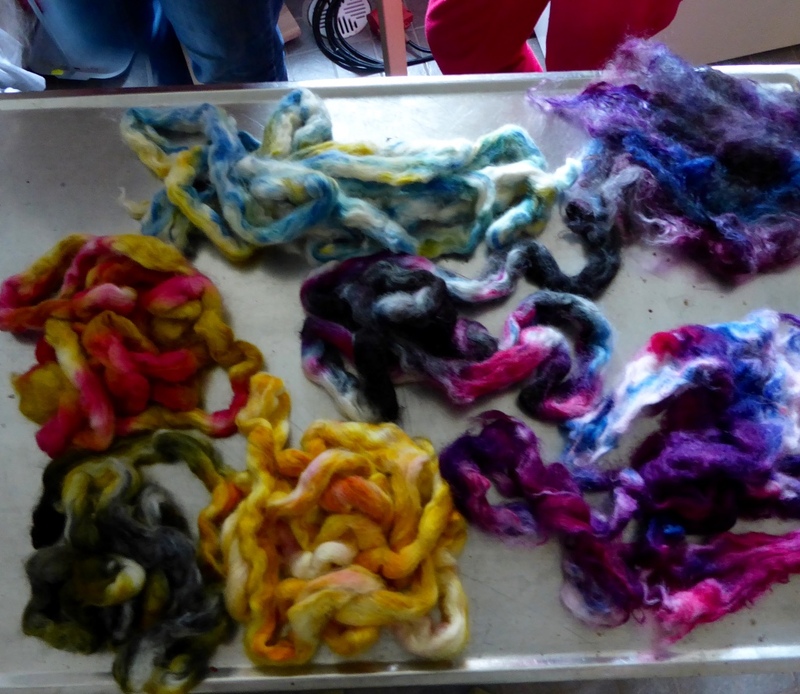 It sounds like you had a lot of fun dyeing and spinning boucle yarn. And with such different personalities, it made it even more interesting for you. Boucle is hard to make – so, yes, you made a nice boucle yarn! 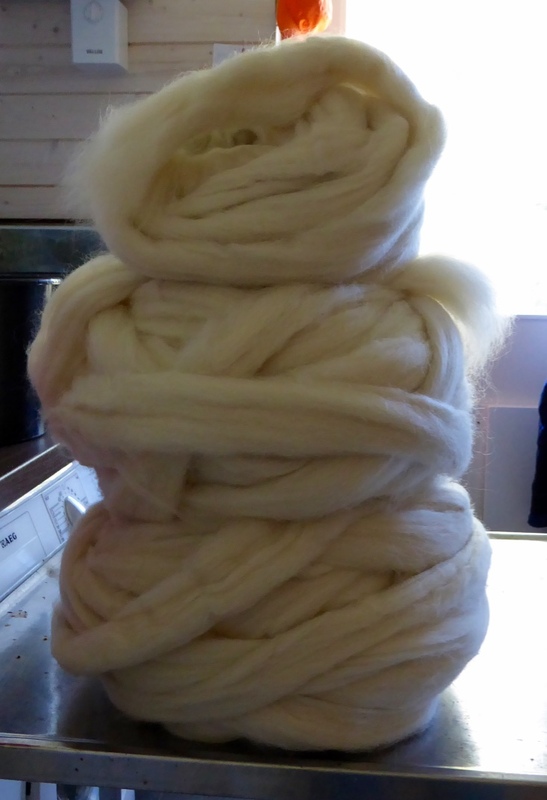 Somewhere I have some spun of pink mohair. LOL. 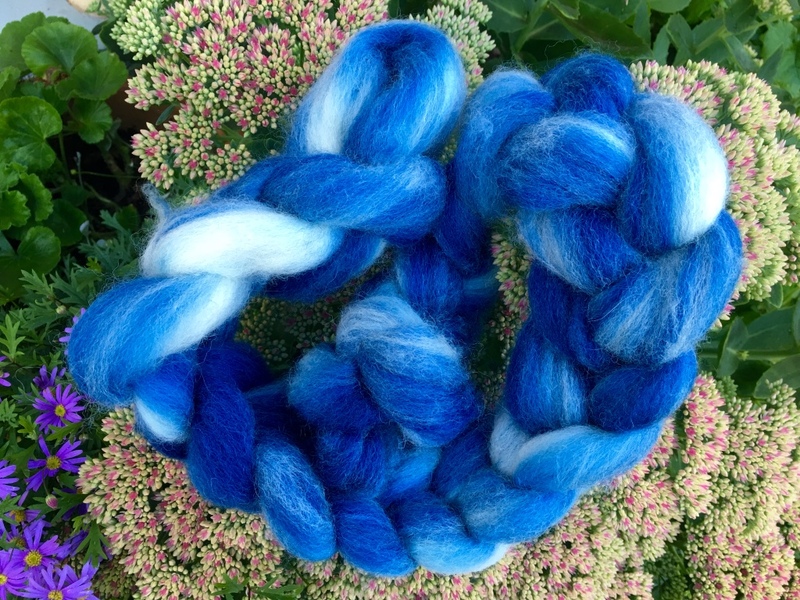 Seeing all your dyed yarns and roving, makes me want to get out the dye pot and do some of my own. It can be so much fun when the results are so quick. Thanks for sharing your trip south. Nice memories for you. Thanks, Marilyn! I saw that this autumn’s Ply magazine features bouclé. Can’t wait to see it! OH, Marilyn did PINK yarn??? I will have to talk to her about that! LOL All the colours and the results were great. Yes, it is so interesting how different we all are and yet we all get interesting results. Results that cheer you up! Haha – I used to hate pink, now I love it 🙂 I find it adds much to many colour combinations that otherwise would be dull. I’m curious: what’s the Estonian knitting book? Might it be the first of the three that’s already been published in Estonian, and meant to be THE Estonian knitting book series? Yes, I believe it is. I’ll let you know the proper title when I get it. It is so beautiful and all the history is fascinating. YES!! the first of 3 and what a book it is 🙂 I can tell there won’t be much knitting done around here for a while! This is so well written and fascinating. OK, I already said that ! but I just love it. The woman who ordered it for us is working on a mitten from the book now, using her handspun and hand dyes for most of it. Lovely work. Ah, good! I didn’t know the English version had been published now. I first heard of the book project from one of the makers, Kristi Joeste. I took her class in Estonian mittens a couple of years ago. They were then working on the Estonian original. On my list of books I must have! Only have to wait until after Shetland Wool Week. September 18, 2016 - 7:23 pm Marilyn F.
Well, I am just catching up with this conversation. Guess I have to check the box saying I wish to be notified of new comments so I don’t miss anything. LOL. Yes, pink boulce yarn – it is really quite pretty and Barbro, you are right, pink does add a bit of dimension to other colors. Thanks for telling us about the new Ply magazine coming out on Boucle. That could be interesting. I can’t wait to get the first Estonian book next week and those that follow too. 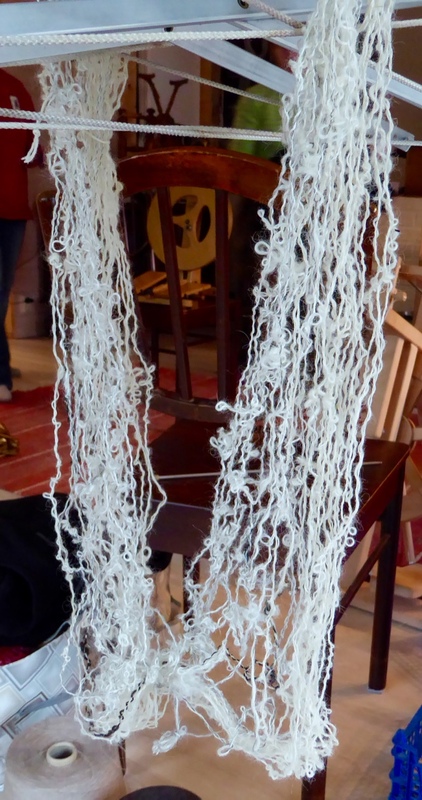 I have visited Kristi Joeste’s blog/website and think she is doing wonderful knitting projects. All of the authors of these Estonian knitting books have an important job exploring the history and knitting of the area and sharing it with the world. Think how much has been lost over the centuries of knitting in other countries. And not all handspun and knitting are beautiful as we like to see today – but ugly and functional – which are more appropriate for the end use. Have a wonderful time in Shetland – we all look forward to hearing about it when you get back. We wish we were going too . . .